This curved chair lift in Fort Collins is custom built to fit the stairs and the user. It provided a seamless lift around the landing and down to the bottom with a park position at the bottom so that a wheelchair transfer is easy. This lift fit within 6 inches of the handrail and runs on battery so that it will always work. 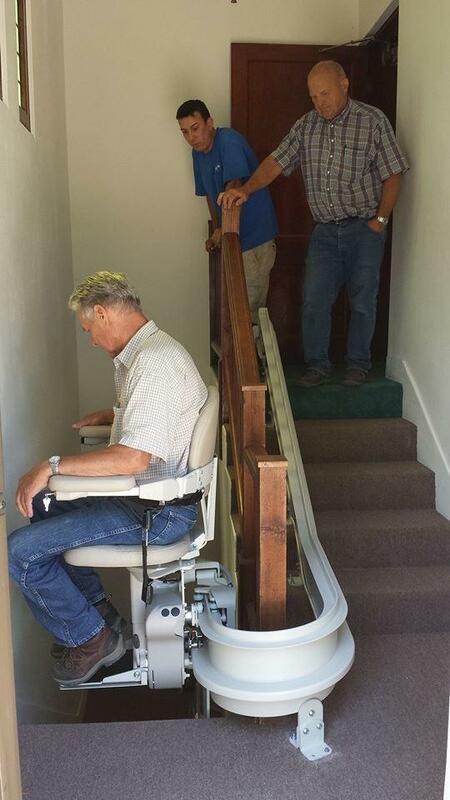 Custom Curved Stairlifts that can curve around all obstacles. This lift has 180° turn plus an additional 90° turn at the bottom. This American Made chair lift was measured with a digital camera that calculates the stairs to each 1/100th of an inch. A Computer model is made and the lift is made in Wisconsin and shipped to us in Colorado. This was installed in a few weeks and fit perfectly. We have installed 100s of these lifts and have the experience to fit your home.